We’ve already seen a lot of action in the Indian smartphone market in 2019, and it’s still quite early in the year. Not only have we witnessed Samsung’s new aggressive stance, we’ve seen new trends like multi-camera setups and punch-hole displays. Q1 2019 has certainly been quite busy as far as mobile phones are concerned. It’d be pertinent for us to see if these affected consumer buying patterns or not, and so, we’re back with our list of top 20 mobile phones in India drawn up on the basis of what users searched for on 91mobiles. It’s worth pointing that these results don’t factor in the actual purchase of the smartphone, but do help indicate the devices that are able to catch user attention the most. The Redmi Note 7 Pro (review) brings back the memories of previous blockbusters from Xiaomi, such as the Redmi Note 5 Pro, that managed to retain the top spot for a long time. It’s not really a surprise to see the Note 7 Pro sitting on the throne. What’s interesting however, is the fact that Samsung’s Galaxy A50 jumped 24 spots to reach second place. The triple rear camera-toting Galaxy M30 (review) also rose one place to find itself at third seating, while the Redmi Note 7 dropped in popularity slightly to sit at the fourth position. 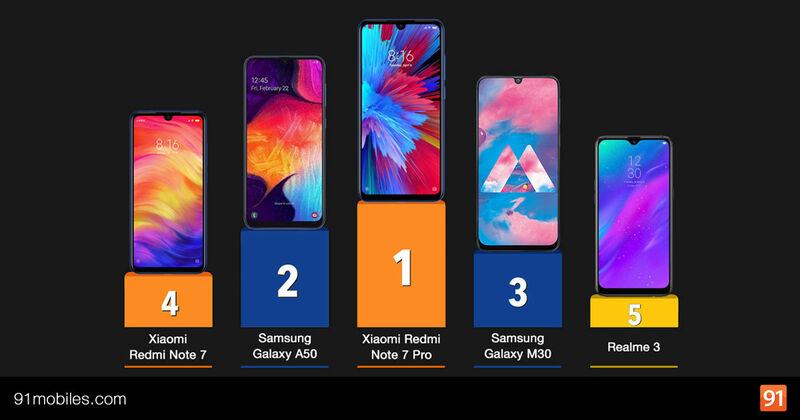 The Realme 3 also saw a huge increase in its popularity as it now sits in the fifth place. Just like the chart-toppers, there are a number of fresh faces among the top 20 phones. So let’s take a dekko at the entire chart, wherein we have also mentioned the price bracket and the month of launch for each of the device. Along with launching the all-new M series, Samsung has also refreshed its A series to cater to not just the budget segment but even the upper mid-range tier. The Galaxy A50 (review) is currently the brand’s most powerful offering in the A series, and boasts some interesting flagship-like features such as triple rear cameras, a 25MP selfie shooter and an under-display fingerprint sensor. Realme kicked off 2019 by launching new variants for the Realme C1 (review), but the Realme 3 (review) is its first new product for the year. As the name suggests, the device succeeds the Realme 2 and continues with a similar proposition as before – powerful specs (thanks to Helio P70, dual rear cameras, and a 4,230mAh battery) and an attractive design. The younger sibling to the A50, the Galaxy A30 (review) also sports an attention-catching glass-like finish. But the device isn’t beauty without brains as it comes with loaded features such as a 6.4-inch full HD+ Super AMOLED display, Exynos 7904 chipset, dual rear cameras and a 16MP selfie snapper. While ZenFone Max Pro M2’s (review) popularity waned a bit earlier, it has managed to jump back in our top 20 list thanks to its recent price cut. With powerful specifications such as a 6.26-inch screen, Qualcomm’s Snapdragon 660 processor, a pair of snappers on the back, and a 5,000mAh battery, ASUS’ smartphone is among the best smartphones priced under Rs 15,000. Xiaomi’s entry-level Redmi 6A (review) has also jumped in popularity again, perhaps because the phonemaker just taken the covers off its most affordable offering in the country, the Redmi Go (first impressions) and consumers started comparing the VFM quotient. Coming back to the 6A, the device ships with a 5.45-inch HD+ screen, MediaTek Helio A22 processor, 2GB RAM, a single 13-megapixel rear camera and an 8MP selfie snapper. The A3s (review) is yet another device that that can boast new-found popularity as it received quite a few price cuts. Available for under Rs 10k, the device brings a 6.2-inch notch-toting display, Snapdragon 450 octa-core chipset, dual rear cameras and a capacious 4,230mAh battery. The Samsung-Xiaomi battle continues to play out in 2019 as well, and with both brands aiming to one-up each other by offering powerful devices at attractive prices, it’d be interesting to see who emerges as a winner. However, in March, Samsung dominates popularity charts with seven of its devices featuring among the top 20 smartphones. Xiaomi follows the Korean behemoth with five of its phones, though if you count the POCO F1 (review) as well, then the Chinese giant isn’t far behind. Interestingly, with these two brands holding the majority of the share in the list, there isn’t much space left for others. And for that reason, there are just seven brands whose devices feature among the top 20 devices. 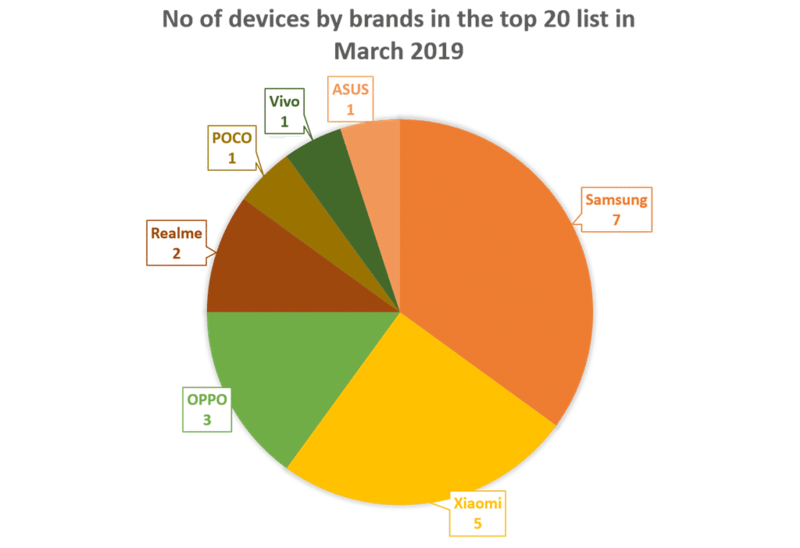 As mentioned above, it’d surely be interesting how this fight plays out over the next couple of months, so be sure to check back next month to see which smartphones rule the roost in April.